Is this the NAS you're looking for? A few years ago mentioning a 'NAS drive' in public would have drawn blank looks and subtle shuffling of feet in the opposite direction. However, as the amount of data we all store rockets exponentially, the need for some kind of hassle-free storage has increased considerably. Although the 'cloud' can answer many of these needs, sometimes streaming from and to the home is either prohibitively expensive, or just dog slow. Enter your friendly local NAS (Network Attached Storage) drive. 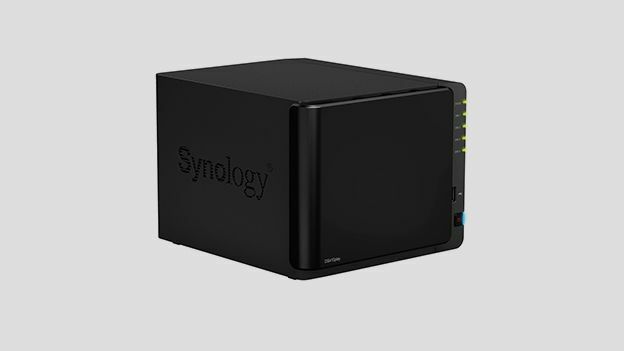 First impressions of the Synology DS415play are that it's a fairly stylish unit (for a black box) with a compact design and front bay access. It is a four bay NAS, with power button, USB and 4 disk lights and a status light to the right hand side. All this is powered by an Dual Intel Atom 1.6GHz chip boasting a 1Gb RAM and Synology's own operating system, Diskstation Manager. The drives are accessed via the front panel, which uses four rubber grommets to hold it in place snugly. To the rear of the unit there are two USB 3 ports for fast transfers to the NAS drive along with a further two USB 2 ports and the network port. Although this NAS requires the user to install their own drives, it's made super-simple by the easy click-to-insert and lock system, so no tools are required. This also means that the disks are easily swapped out while in use – hot swappable – but the average home user is unlikely to want to do that often. The real magic of getting this system up and running is in the Diskstation Manager (DSM) software, which is available through a web browser. A few setup steps with username and password setup along with the usual raft of options and updates etc. and 5 minutes later it was up and running. Next up we installed apps from the package center, Antivirus Essential, iTunes server, Photo station, Audio station, Video station, Cloud station and Media Server. This system is great for those who don't want to get their hands too dirty, as it sets up all the right folders so you can place documents and files in the relevant places ensuring trouble-free access. For those who prefer the more under the hood approach you can simply setup shared folders, set access permissions and add users just the way you would in other network situations, through the control panel. Connecting the diskstation to the internet was also simplicity itself, by using the EZ-Internet app it sets up your router to allow you to reach the unit remotely. You have to setup a account with Synology allowing you DDNS and quick connect account, which then makes accessing your files quick and conveniently using the apps. Also in DSM there is a security advisor, which checks to make sure that your system is safe on the internet, with both a personal and business setting, a nice touch. When using the iOS apps, it is evident that a fair amount of time and thought has gone into making them work effortlessly. A free download from the iTunes app store, DS photo+ allows you seamless access to the photos folder on your system. Clean and uncluttered, it has a variety of handy functions such as downloading the photos you view to a cache so you can view them at a later date, and it also allows the usual raft of sharing/ emailing options. It also gives you the option to backup your Photoroll from the iPhone itself onto your NAS drive, thus potentially avoiding Apple iCloud confusion and making it even harder to loose those dodgy selfies from your night out. Setup is simple, just requiring your Quickconnect diskstation name, username & password. Similarly the DS video, audio and file apps all worked seamlessly – there's also DS finder which provides running info about your NAS in case you're interested, such as storage remaining and running temperature, both fairly crucial for those all those videos and other media you'll be wanting to store. Last up is the Media server, which enables you to use the DLNA standard to transmit media to DLNA-compliant devices without any other faffing around. We found it steamed 1080p media seamlessly, with excellent picture quality. This NAS should be definitely be considered by the media hungry user – it's relatively well priced, has enormous storage and requires very little setup. Obviously you need to be happy buying your own HDDs, but they're so easy to install this shouldn't be a worry. A maximum capacity of 24TB means even the most energetic hoarder of data should be well-catered for, while the host of mobile apps makes keeping the data in check a synch. Add to that transcoding abilities through media server, DSM 5.1 and plethora of other features, and you've got something to shout about. Like many NAS units, the Synology DS415play NAS drive does suffer from a slightly plastic-y build quality, which is a shame as companies such as OWC have made (albeit with out DSM/ networking abilities) a great JBOD/ RAID out of sculpted aluminum for a similar price. However, the ease of use and performance here does offset that, and once a 24TB NAS is up and running it's rare to go fiddling with it often.